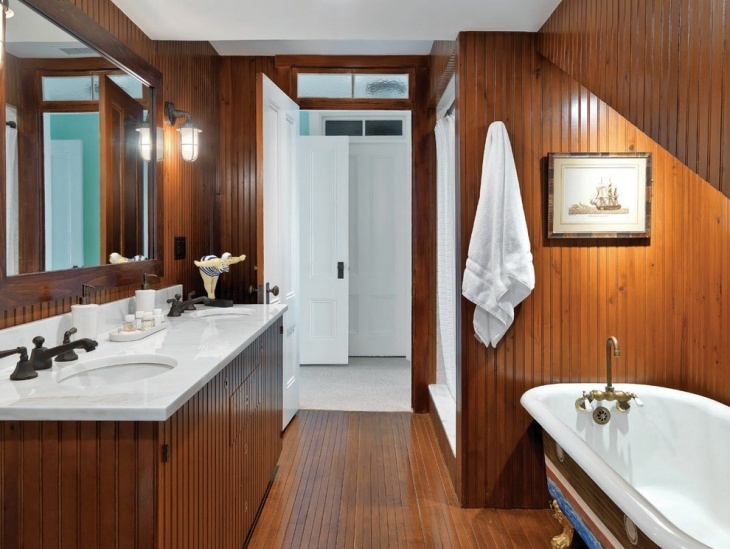 You do not have to be a sailor to want a nautical bathroom design. 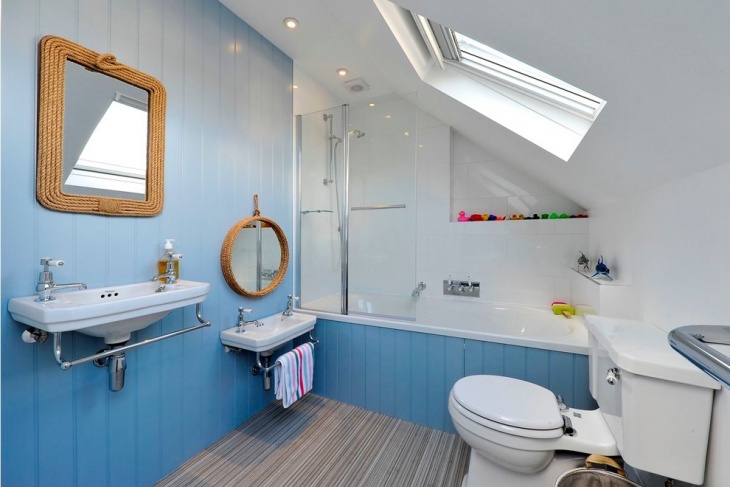 Some people who love the sea and the idea of being out there sailing, contend themselves with having the nautical theme incorporated in their small bathroom ideas. This theme is popular because of the relaxing beach life feel. 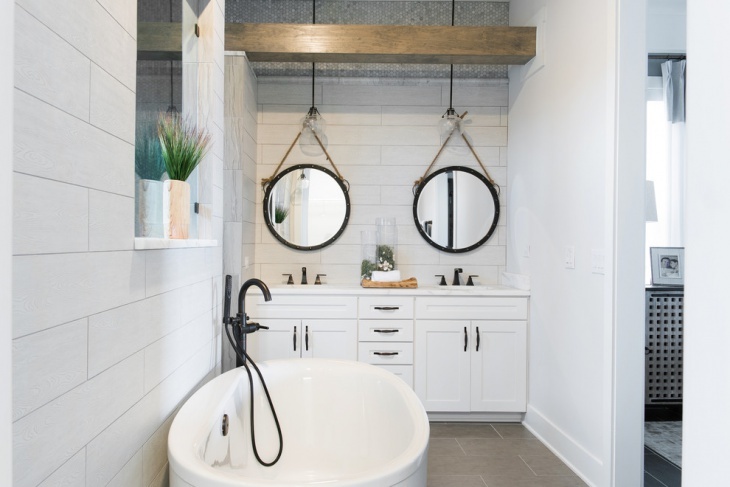 With some decorating tricks and maritime accents (like the definitive blue paint, circular mirror, seashells, anchor and more), you can easily have your dream nautical bathing paradise. 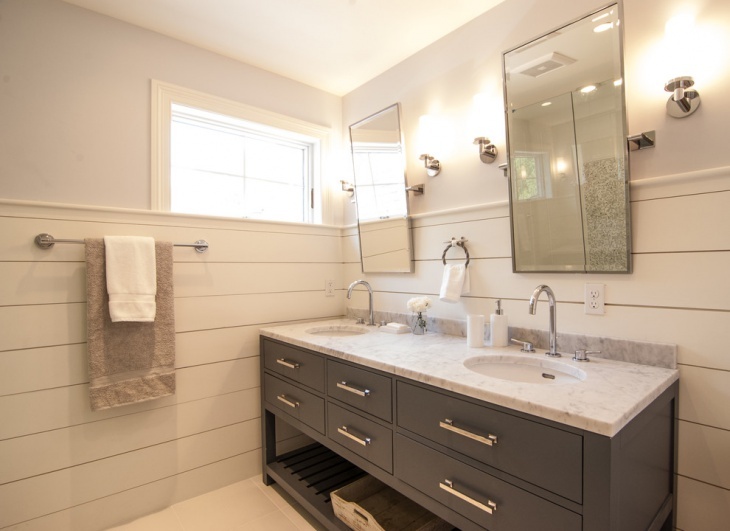 This small bathroom is designed in simple nautical theme using light blue paint color for the sink wall and the base for the tub. The small circular mirror is a perfect nautical accent, as well as the square rope-framed mirror. The toy sharks add some beach bathroom feel. What can be more relaxing and pampering than soaking on a tub and looking at the window to enjoy the serene beauty of the blue sea? 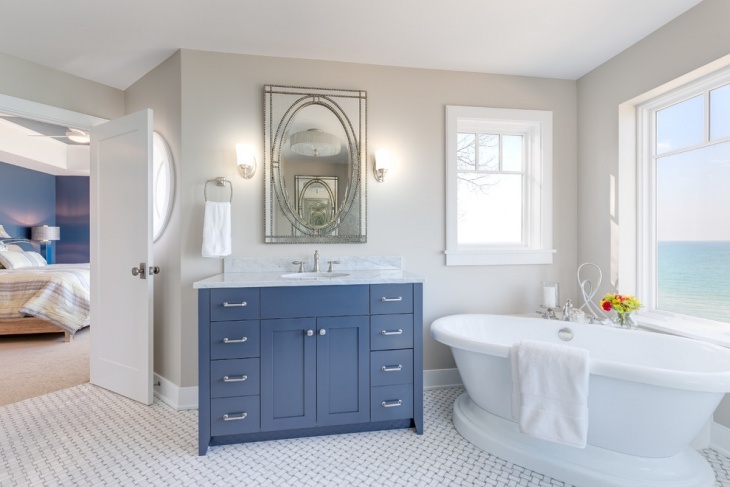 This elegant bathroom is designed with a blue vanity that conveys the feel of the beach – it stands proud amidst the whiteness of the rest of the room. This bathroom has subtle ocean-inspired accents. It has cabinetry with driftwood finish to match the floor tile in driftwood-look. The sea glass-inspired mosaic detail adds nautical accent that provides beachy relaxation. 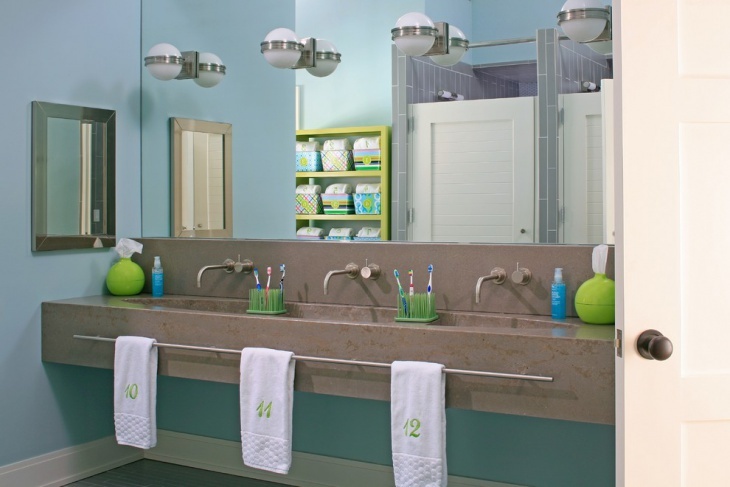 Give your guestroom a new appeal by creating a coastal bathroom look. The circular mirror on blue wall provides the nautical feel, while the wooden vanity with white sink conveys rustic appeal. Even without the blue paint, you can still create a bathroom with nautical feel by using neutral colors. 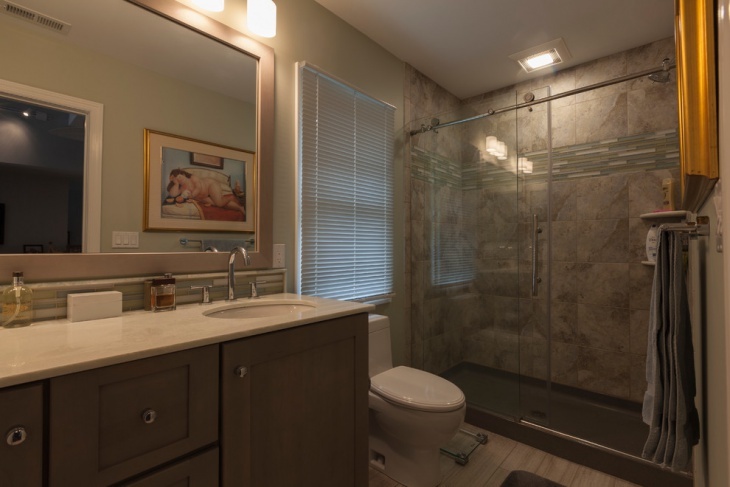 This bathroom is bathe in browns and creams, giving the whole setup that wonderful and relaxing beachy nature atmosphere. 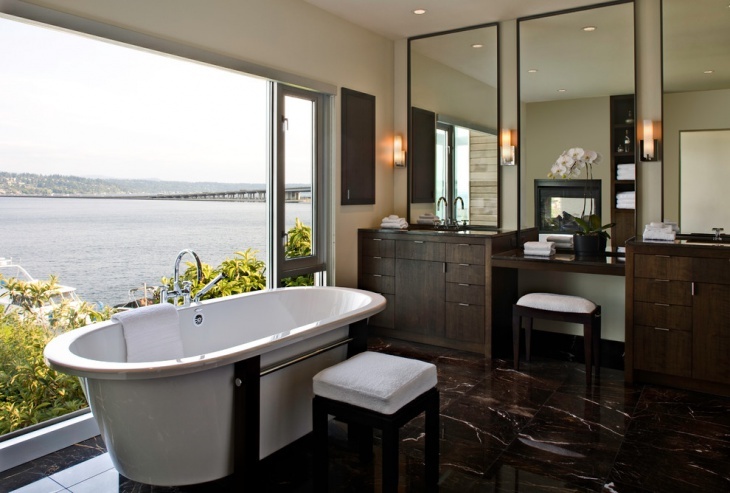 Get the vintage look for your bathroom, by having a french door that opens to the breathtaking view of the lake. 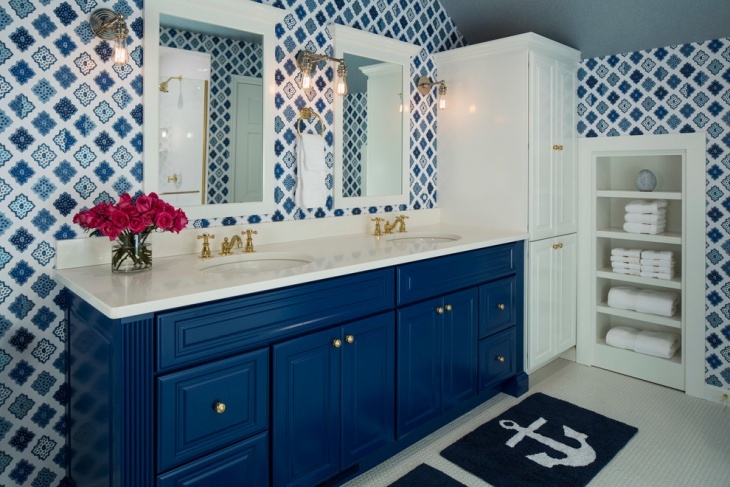 This bathroom is not dressed in traditional nautical blue, but it definitely oozes out with beachy appeal. The white free-standing tub is just gloriously relaxing. 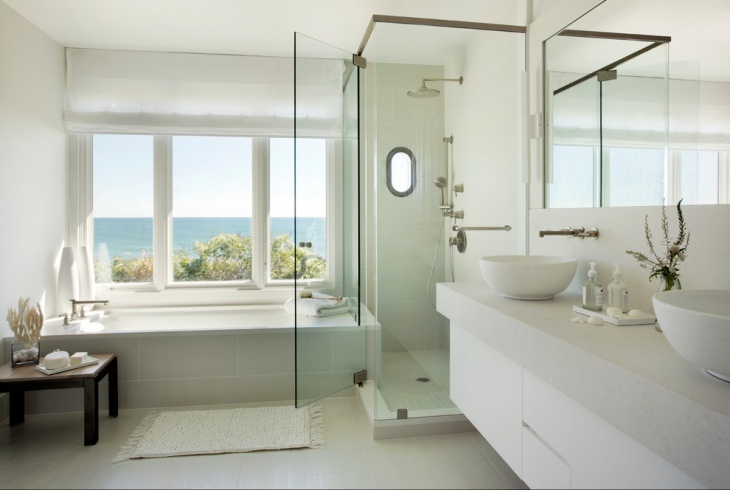 This beach-house bathroom has a window that overlooks the water. That alone is enough to provide the relaxing nautical appeal. The whiteness of the whole room offers the relaxing beachy feel indoors. 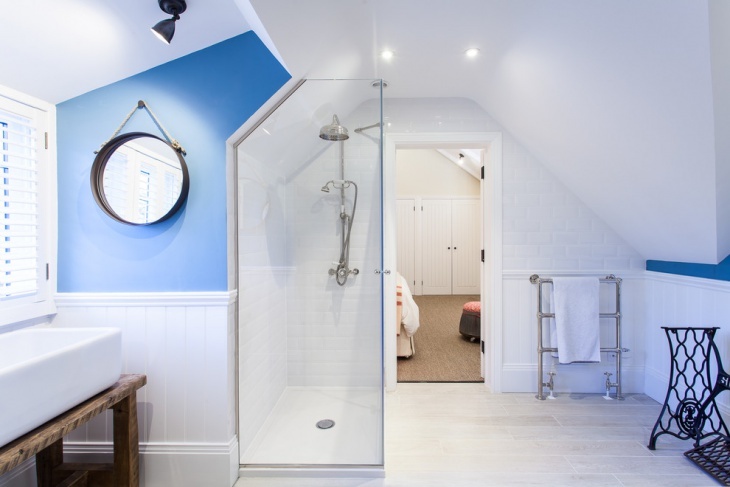 The small window in the shower space provides the maritime appeal. 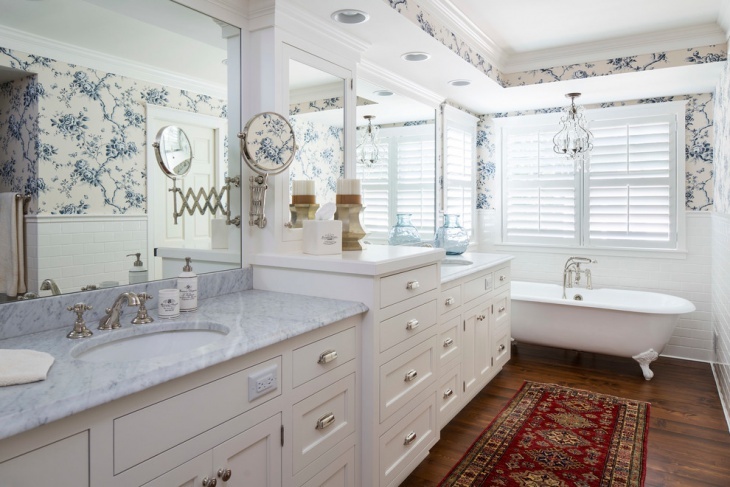 This bathroom’s cabinetry design is nautical in theme, and it is matched beautifully by the contrasting red accents (towels and decorative pieces). 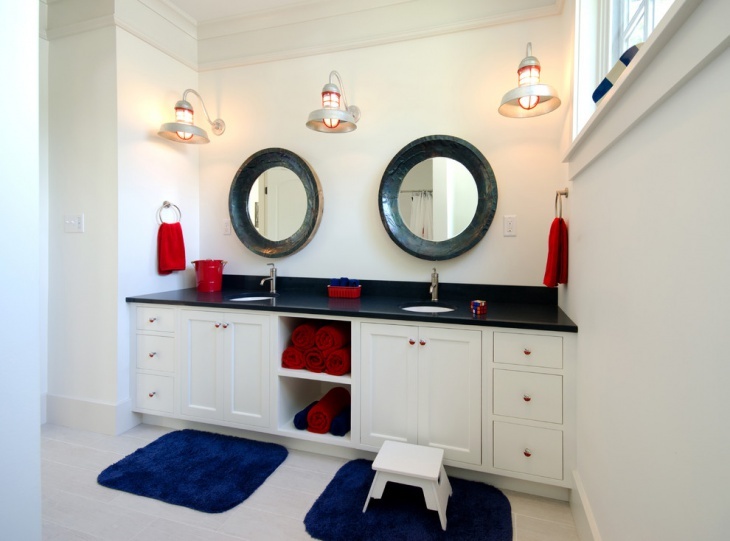 The dark marble vanity top is matched by the dark framed circular mirrors and the dark blue rugs. 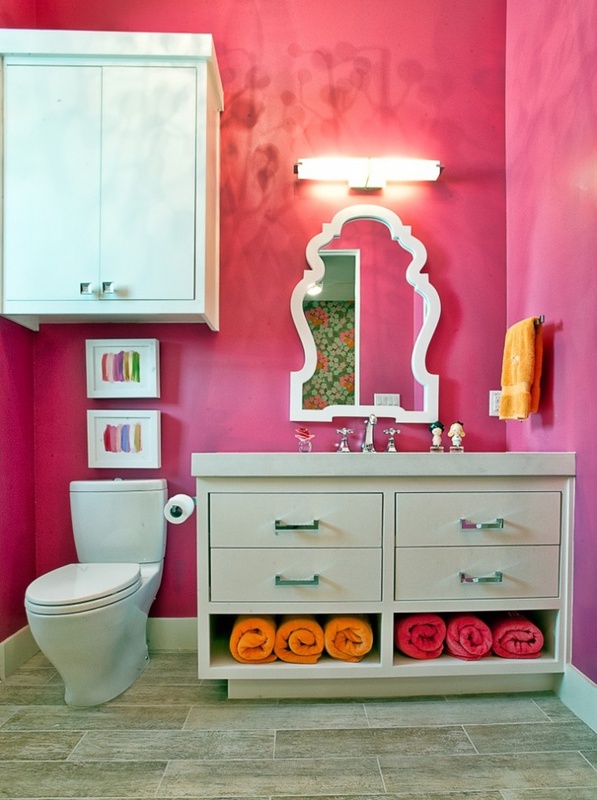 This is a pink bathroom with a nautical appeal. The white vanity is matched by the white cabinet over the toilet. The white framed mirror stands out amidst the pink background. 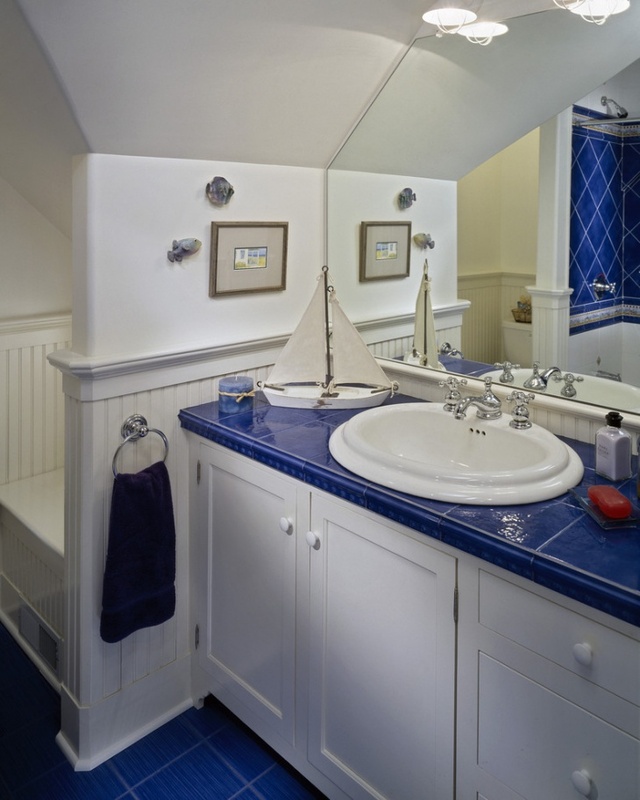 A sailboat on the sink top is enough to convey that this is a traditional nautical themed bathroom. The blue tiles used for thr vanity top is the perfect match for the blue tiled wall. The white sink matches the white sailboat, white cabinetry system and the white toilet space. This in indeed one blue and white bathroom that conveys perfect beach atmosphere. 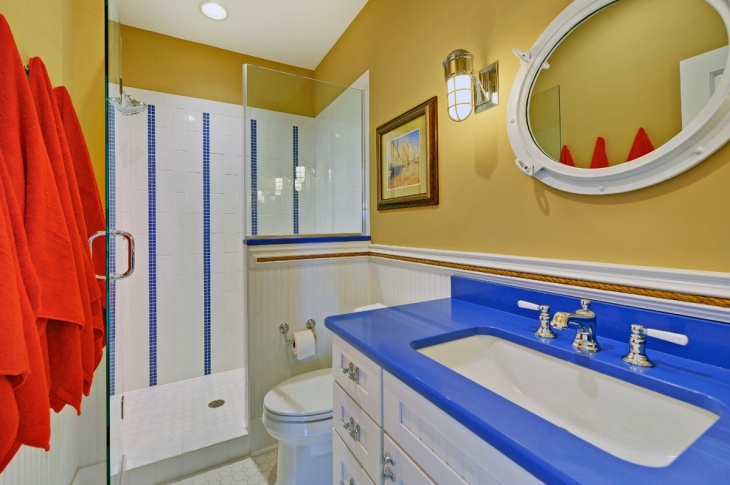 You do not need a spacious bathroom to incorporate a nautical theme into the interior design. 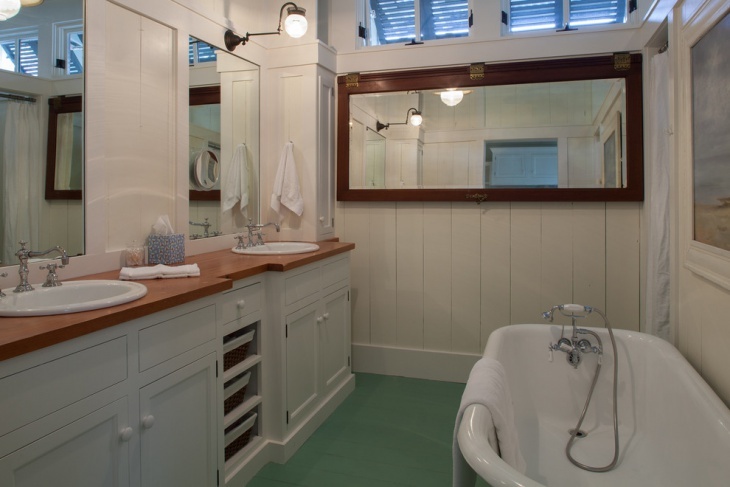 There are several small bathroom ideas that can be nautical as well. All you need to do is to use some accents that are naturally maritime or beachy. Some choices include; toy sharks, circular mirrors, anchors, sailboats, blue paint, ropes, circular windows and many more.